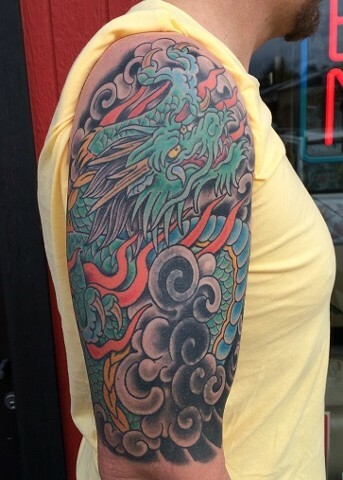 Healed Japanese style dragon half sleeve. There is a cover-up of an older tattoo in the clouds. Hiding an older tattoo with a cover-up can be done easily with a larger tattoo. Done by Dirk at Gold Standard Tattoo in Bend, Oregon. Japanese dragon half sleeve. Dirk Spece.Gold Standard Tattoo Shop. Bend Oregon.